HalTech’s HCO202 handheld carbon dioxide meter makes it easy to take quick and accurate measurement of CO2 levels. Featuring the dual-beam, non-dispersive infrared (NDIR) absorption gas sensor technology, the HCO202 has a wide measuring range and quick response to ambient changes in carbon dioxide concentration with long-term stability and durability. 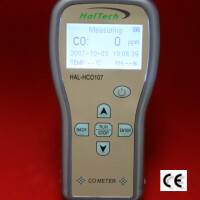 HalTech’s HCO107 Carbon Monoxide Meter makes it easy to take quick measurements of low CO levels. Featuring the newest generation of electrochemical sensors, the HCO107 is a point-to-sample instrument and responds very quickly to ambient changes in CO concentration with a built-in pump. The special circuitry design allows for no drift and accurate measurements. 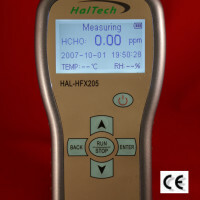 The HAL-HFX205 formaldehyde monitor/meter is designed for use in a wide variety of applications such as furniture, floor boards, wall papers, paint, gardening, indoor decoration, construction, dye stuffs, paper manufacture, pharmaceutical, medical, food, cleaning, synthetic resins, textile treatment, horticulture and cosmetics. Portable Liquid Laser Particle Counter utilizing the principle of “near-angle light scattering”, a revolving laser beam passes through the walls of a glass container or a flow-thru cell. When it is directed through a central “sensitive zone”, the LPC230 not only counts the particles in suspension, but also tabulates their size as well. The analog signals generated by the light pulses are routed to a computer and digitized. 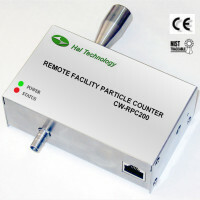 The HAL-RPC201 Remote Particle Counter is the key element of an intelligent multipoint remote facility monitoring system. It is useful in measuring particle concentrations in ultra-clean environments by its single particle counting ability and classification of clean facility. The data collection and sampling time interval can be remotely carried out by a remote computer terminal. The system can run 24/7 continuously and remotely monitor the status of the clean facility and give warning of an excess of count limit preset by the user. It is in compliance with international standards (JIS B 9925:1997 and ISO14644-1) and CE certification. Intelligent multipoint remote facility monitoring system. It is useful in measuring particle concentrations in ultra-clean environments by its single particle counting ability and classification of a clean facility. 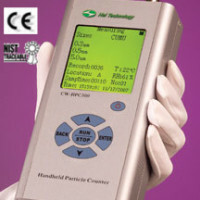 The data collection and sampling time interval can be remotely carried out by a remote computer terminal. The system can sample 24/7 continuously and remotely monitor the status of the clean facility and give warning of an excess of count limit preset by the user. It is in compliance with international standards (JIS B9925:1997 and ISO14644-1) and has CE certification. 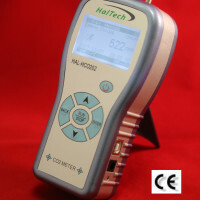 HAL-HPC300 Handheld Laser Particle Counters measures particles suspended in the air in real time with applications such as microelectronics, fine mechanics, optics, pharmaceutical, medical device, food processing, and aerospace. Because of its low-cost affordability, it is also widely used for indoor/outdoor air quality (IAQ) application. The basic operating principle of the HAL-HPC300 is that pulse signals generated from laser light scattering off aerosol particles are processed and counted, based on digital signal processing. 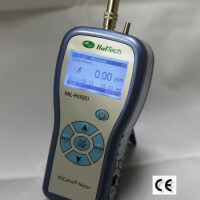 HAL-HPC600 6-channel handheld laser particle counter is the world's first of its kind hybrid handheld optical particle counter. 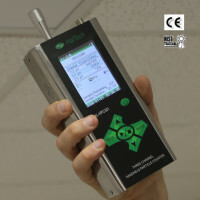 The instrument is a truly breakthrough of new generation of particle counters that combines the traditional handheld instruments with functionalities of portable instruments for ultra-clean environment and indoor air quality applications.